Phil Hughes is the real deal. No, I mean it...he's the Mac Daddy. Check his stuff out next time he pitches and you'll see. How is it that so many rookies are sucking wind and hurling lunch at their rookies minicamp? Interesting article in the Boston Globe saying that now that Vernon Wells is healthy and producing, the Blue Jays might want to trade him. Why? Because Wells has a 126 million dollar contract that runs through 2014. Lotsa luck, Blue Jays. i just can't see anyone doing that. I guess Joe Torre isn't a genius anymore. I get that the Phillies needed to keep Ryan Howard. And I think Ryan Howard is a dangerous player. But still, I just don't see paying him 25 million a year. He can't hit lefties, and Ks way too much. I just think he's very good, but not that good. True to what I predicted, the Seattle Mariners have a fantastic pitching squad. However, they still can't hit, batting a pathetic .236 as a team. Hello? Jermaine Dye? It's getting a little ridiculous how big these college sports divisions are going to be. Some reports have the Big 10 expanding to the Big 16 and the Pac 10 swallowing up Boise State and a good portion of the Mountain West. OK, fine, if it just comes down to a 4 mega-divisions—say SEC, Big 10, Big 12 and Pac-10—maybe we could finally institute a 4 division championship series like college basketball has. I really wish announcers would stop saying "Get off the schnied." I really do. The Rays have a huge slate of important free agents, headlined by Carlos Pena, Carl Crawford, Pat Burrell, and Rafael Soriano. Grant Balfour, Gabe Kapler, and Randy Choate will also be eligible. The group earns about $40.4MM this year, more than half the Rays' payroll. If Wheeler departs, $43.4MM will come off the books. Forget about Crawford, he's gone. No way they resign Pat Burrell. Randy Choate is replaceable, as is Gabe Kapler. Look for the Rays to try to keep Pena and Soriano, and maybe Balfour who's quietly done a good job. But it's unlikely they can get all 3. It feels like the Utah Jazz have needed a game-breaking small forward who could defend a little since....well, forever. How desperate are the Redskins to get wideout help? 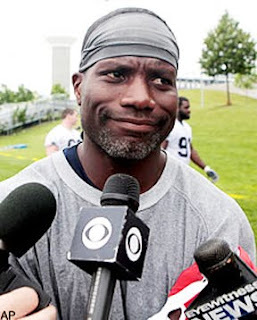 They brought in literal greybeard Joey Galloway, who you remember was drafted in the NFL Draft class of 1947. Joey....shave that beard buddy. Is it time to move Javier Vasquez to the bullpen and Sergio Mitre to the rotation? No? Not yet? And lastly, no explanation needed. Just a genius who compiled some of the best NFL runs of all time. Watch and enjoy.